We have a Seig X2 supermill (http://www.axminster.co.uk/axm.....rod715053/) and we bought two digital readout units to fit to it like these: http://www.steves-workshop.co......illdro.htm but differently branded, from Axminster (410190 and 410208). We also bought two remote display units to go with them. £200 or so, all in. The first problem we saw was that the remote displays connect to the readout unit via a plug which is so poorly fitting that it falls out under it's own weight. True of both displays/senders. We got round that with superglue - no going back now. We fitted the X (left/right) axis sender unit behind the table in the middle on a single bolt into a drilled tapped hole into the casting. We secured the rule at each end with a single bolt in the same way. 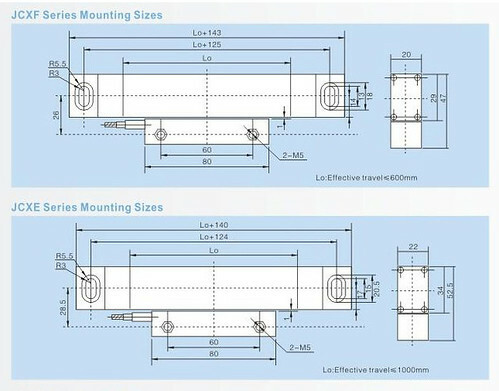 When measure with a small rule by eye, we can see no more than half a millimeter error in the alignment of the ruler in any plane, relative to the table, over its 300mm length. What error would this introduce in the readout? Well, if we consider the DRO's rule is the hypotenuse of a right angle triangle, the 0.5mm error at one end as the opposite side, and the bed itself is the adjacent of 300mm in length then Pythagorus' theorem says that the hypotenuse of this triangle is root (300 squared plus 0.5 squared) which is 300.0004166 - a 1.3 x 10^-6% error. Insignificant. But in use, it's always inaccurate by more than 5% - half a mm over 10mm. Entirely unacceptable. We concluded this by comparing it to the milling machine's mechanical dials and a DTI mounted on the table measuring against the vertical quill. If we assume the DTI is perfect, then the dials are pretty good - small amounts out both up and down throughout the travel, but no overall error trend. The DRO however, is dismal. The sender is solid - it doesn't move when the bed does - verified by the DTI. Neither does the rule. So what's up? Perhaps the units are just rubbish. Perhaps we have bad ones. Perhaps our installation is poor or electronic noise is affecting them. If you can see a flaw in any of our thinking, or can share relevant experience, insights or ideas, then please chip in. Right now we're poised to send them back as worthless rubbish. I have a CNC X2 mini-mill and I'd like to start building a CNC router within the next couple of months so I can cut out bigger pieces of wood, plastic and maybe aluminum. I'm researching designs and trying to decide who has the best plans. Prices for drivers have really dropped and I also have to decide if I'm going to buy a low-risk and better performing Gecko 540 for about $250 or an imported $85 4-axis driver. I'm inclined to go with the cheaper solution because I think I have readers who would be very interested in a good low-cost solution if there is one. If you're shopping for parts then check out carolbrent on eBay. I've purchased some things from her and she has great prices and an excellent reputation. She has a 4-axis driver, power supply and stepper motor kit for about $310. The popular CNCFusion ballscrew kit runs about another $450 and there are also some cheaper options available for leadscrews. Miscellaneous hardware will probably cost you another $100-$200. So basically I think you can convert a X2 mini-mill to CNC for less than $1000, and maybe for as little as $500 – $600 if you shop carefully are wiling to use acme screws. You'll also need a computer with a parallel port. It doesn't need much horsepower so you can use something old and cheap. Mach3, the very popular CNC controller software, will cost you $175 but you can do a lot with the free/demo version. Especially if just want to operate in what I call "power feed/DRO/conversational milling" mode. You can also use EMC which is completely free. I'll probably be able to offer some more ideas or advice after I get back from the Digital Machinist CNC Workshop in Ann Arbor next week. BTW, I share your problem with finding time in the workshop because of kids. My granddaughter wears me out almost every weekend from Friday night to Sunday night. Chores and activities with my wife usually eat up at least another night or two. So if I'm really lucky I get to spend one or two nights in my work shop each week (and I haven't been lucky lately). I haven't speced out the exact lengths needed yet. A nice guide on dropros.com is provided to get the right lenghts. I just found someone mention those lengths on another post. agreed that this system is overkill for an X2, but i have a business trip to China planned so i can pick these up local for about $325 out the door which would likely be cheaper than the lower end alternative that people are typically putting on the X2. The ebay ad price shipped from China is about 1/2 that for a US source since all of these come from China as the manufacturer. Their prices seem good. I'd like to hear the details if you buy one and install it. I agree with scale lengths you've picked out but it seems like the overall length of the scales could be considerably more. Have you considered that? BTW, a standard X2 will move about 8.5 inches in the X-axis and about 3.5 inches in the Y.
I've also got to say that this DRO might be a little "over kill" for an X2. If it was me I'd either look at a cheaper alternative or go all in and connvert your mill to CNC, which give you a nice DRO read-out and a lot of other capabilities. BTW, did you see this discussion on the Home Shop Machinist? this is the specific info from the ebay add on the scale sizes and specs. For the X2, i think i need a 12, 6, and 8" scale, XYZ respectively. 50, 100, 150, 200, 250, 300, 350, 400, 450, 500, 550, 600, 650, 700, 750, 800, 850, 900, 950mm/5um (1 inch equals 25.4mm), the length refers to the real travel of the linear scales. You may choose any three glass scales in the range above (real travel from 2 inch to 37.5 inch). Please contact the seller if you need longer scales or scales with 1um or 0.5um resolutions. Longer scales are more expensive. We supply long scales up to 2200mm/87" travel by door to door air shipping. We also supply slim scales to fit the cross slide of your lathe.